Are you looking to upgrade your existing boiler? Need to install a unit that will provide you with reliable service for years to come? Let us help you choose the right kind of boiler for your needs. Call FD Plumbing & Heating on 020 7060 4770 to discuss your needs. We serve London and surrounding areas. All boilers are pretty much the same, right? Well, if you’ve started doing some research into the different makes, models, sizes and outputs then you will have quickly found that this is not the case. But don’t worry, we are here to help! Whatever level of budget you’re working with, it’s important to choose a boiler that’s suited to your plumbing setup, the size of your property, and your heating and hot water needs. If you give us a call, we’ll get one of our Gas Safe registered experts to come over and meet you. They can advise on exactly what type and specification of boiler would suit your home best, and then we can help you to choose a model that fits the bill and works with your budget. Your new boiler will almost always be a ‘condensing’ boiler. These boilers covert more gas into useable heat and cut the amount of Carbon Dioxide emitted by up to 25%. They should also save you several hundred pounds a year on heating costs. There are three basic types of condensing boiler: Regular (also known as Traditional, Conventional or Heat Only), System and Combination (or Combi for short). Which type is best for you will depend on your home and needs, but we’ll be happy to give you advice on this. Don’t worry! You won’t need to know anything technical yourself. We’ll look at the pattern of your heating and hot water usage throughout the day, and at whether you’ve converted, or may in the future convert, your loft (as a Regular boiler needs some loft space for tanks, while System and Combi boilers don’t). In making the decision we’ll discuss with you where you plan to locate the boiler and so where the flue will be, as condensing boilers give off a cloud of steam (or ‘plume’) into the outside air, and you won’t want to annoy either yourself or your neighbours by having it billowing past a window. Combination boilers are really economical on space, which is one of the reasons they’re so popular. As well as powering your heating, a Combi boiler heats hot water for you as you need it. This means you don’t have to have a big storage cylinder taking up room in a cupboard. And whereas conventional boilers need to have a cold water tank in the loft to draw from, a Combi boiler draws directly from your mains water supply so you don’t need the tank. If you’re replacing an old boiler in a family house it’s likely that this will be a Regular boiler system. This means you’ll have a boiler; a large cold water storage tank and a feed and expansion tank (also known as an F&E tank) in the loft; a large hot water cylinder in a cupboard; a timer control unit fixed to a wall somewhere; and a room thermostat. 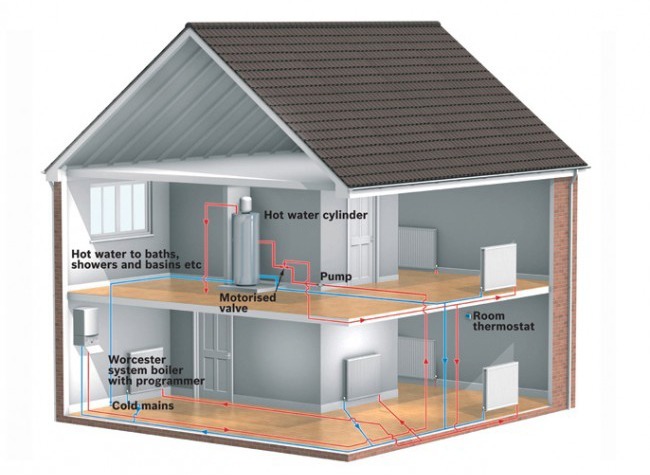 The choice between a Regular boiler and a System boiler installation will come down to the type of property and the layout of your system – some are more suited to one type over the other, and one of our heating experts will be able to guide you. If you need help deciding which boiler would suit your needs Call FD Plumbing & Heating on 020 7060 4770 in London today. We have Boiler experts ready to assist with any technical enquiry you may have.